It's small, no bigger than a mouse and it's Australia's only hibernating alpine marsupial. But for the mountain pygmy possum, its hibernating lifestyle might be its biggest threat. The animal, first discovered in 1895 as a 10,000-year-old fossil, was believed extinct until 1966 – that's when one turned up, very much alive, in the Snowy Mountains around 200km south of Australia's captial city, Canberra. 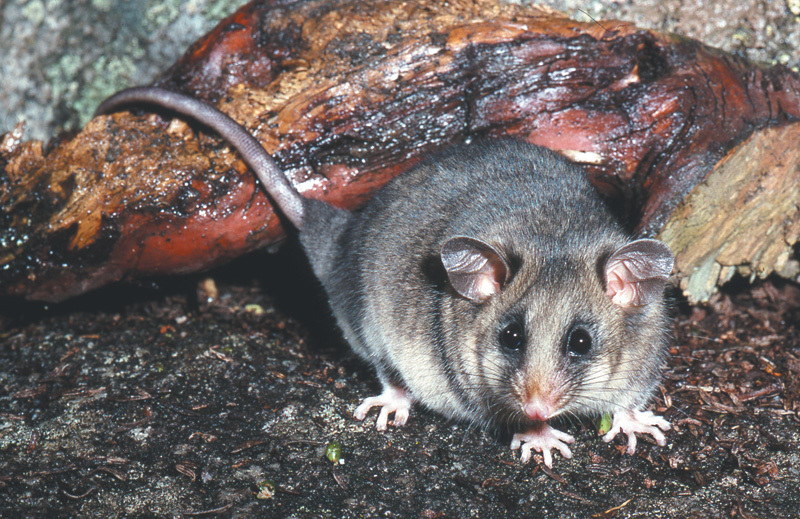 The mountain pygmy possum is listed as critically endangered by the IUCN. Image: Mike Archer. 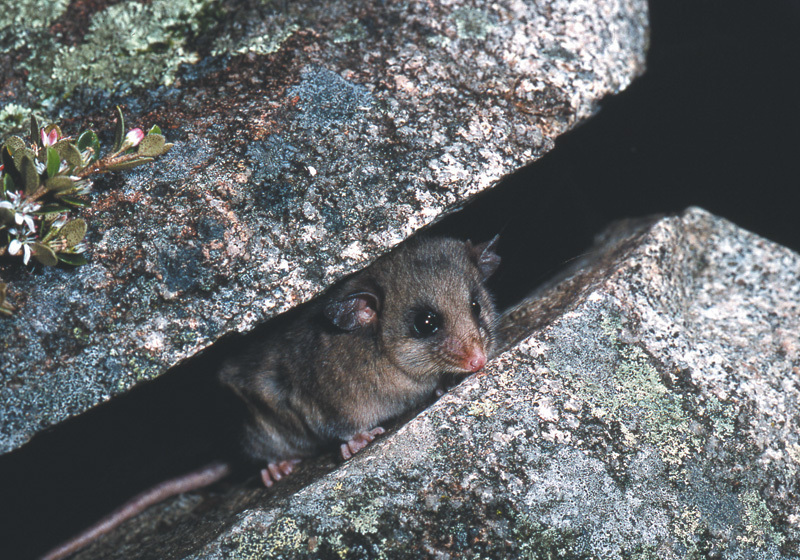 Today, the IUCN lists mountain pygmy possums as critically endangered, and they survive in only three mountain strongholds: around Mount Kosciuszko in Kosciuszko National Park (in New South Wales), on Mount Higginbotham and Mount Bogong on the high Victoria plains, and near Mount Buller (also in Victoria). The three populations are isolated from one another, which is not good for maintaining the genetic diversity necessary for the species to survive long-term. Genetics, however, is not the only problem the poor possums are up against. They also face increased predation from foxes and feral cats, as well as from habitat destruction as Australians build more ski resorts. A few years ago at a resort in the Australian Alpine National Park, the construction of a new main road prevented male possums – solitary animals that live apart from female groups – from migrating to their nesting ground. But perhaps the biggest threat to the possums is melting snow. For thousands of years, the tiny marsupials have buried themselves in the snow of the Australian Alps during the harsh winter (in some cases, for up to seven months! ), using the snow to insulate their bodies against the cold. Whilst hiding, the possums reduce their body temperature down to as low as two degrees Celsius, through a process known as torpor. But recent increases in temperature in and around their remaining habitats are now threatening to melt the snow mid-winter. Should this happen, many sleeping possums would freeze to death. "There are fewer than 2,000 possums left," says Professor Mike Archer from the University of New South Wales School of Biological, Earth and Environmental Sciences. "A couple of warmish winters and we could lose the whole lot." Archer warns that just a 1% rise in temperature in the mountains could be enough to cause the snow to melt – but he also believes that we shouldn't write the possum off just yet. That's because the mountains where the little nocturnal ground foragers live today are not their historical home. Mountain pygmy possums actually originated much further downslope in the lowland rainforests – and Archer wants to take them back there. "The fossil record shows that the possums lived in those sort of environments for 26 million years," he explains. He adds that these parts of Australia have hard, rocky terrain, warmer temperatures, and obviously, no snow. That means, back then, there was no need for little possums to hibernate ... and no need for them to worry about slight jumps in temperature. Archer isn't sure how the possums ended up where they are today. "They're adaptable animals," he says. "Maybe they were driven into the mountains by human activity, adapted to climate changes, or maybe there was a period of pre-history when it got a lot hotter and the animals spread upwards and never came back down." Rainforest covers parts of eastern Australia's low-lying areas and Archer wants the country's conservation authorities to consider his plans to investigate whether the possums could be successfully re-established there. Professor Mike Archer wants to establish a captive-breeding colony to see if the alpine possums can adapt to conditions downslope. Image: Mike Archer. His plan has two stages. First on the cards is a captive-breeding colony at Secret Creek Sanctuary on the edge of Wollemi National Park in New South Wales. This would enable Archer and his colleagues to find out whether the possums can adapt to conditions downslope – and provide a safety net in case existing wild populations become threatened by the warming winters everyone is worried about. In the long term, it would also help boost genetic diversity by allowing individuals from the three isolated possum populations to mix. Stage two of Archer's plan would see a few possum pioneers released into the new habitat. "Breeding success would enable us to release some acclimatised individuals into lowland forests, under carefully controlled conditions," Archer says. He adds that there's no evidence in the fossil record that suggests mountain pygmy possums in lowland areas had an adverse effect on other species, and is reasonably confident that reintroducing the animals would not create problems in today's lowland rainforest ecosystems. "If anything, they seem to promote biodiversity," he says. He adds: "We already know from earlier breeding programmes that the possums don't need to hibernate. Hibernation seems to be a relatively recent adaptation to living above the snowline." He believes that these animals will thrive at lower altitudes, thanks largely to a greater abundance of food (food like the possums' favourite, the Bogong moth, which is growing increasingly scarce in the alpine regions). Three UNSW research students are currently working on 'project possum'. They're investigating why the animals have remained in the mountains instead of re-colonising the lowlands and looking into their ecological role in past ecosystems. The researchers are also trying to determine whether increased stress makes the possums more vulnerable to parasites, and whether this might hasten their decline if nothing is done about it. "We do expect to have the breeding facility up and functional this year, although a number of things have to happen before that time," Archer says. This includes obtaining a permit from wildlife authorities to construct the building, which will include a rock wall that mimics the possums' alpine habitats and keeps the temperature at about four degrees during winter. "We're also desperately trying to raise more money for the breeding facility. But we'll get there!"